The only direct mention of slavery in August Wilson’s Jitney comes minutes after the curtain rises. Youngblood (André Holland), a young, black Vietnam vet who works alongside a multi-generational group of African-American cab drivers, is asked by his co-worker Turnbo (a generation older, played by Michael Potts) to grab a cup of coffee from the restaurant next door. Youngblood delivers a quick response, “I ain’t your slave. Walk over and get your own damn coffee,” on his way out the door. Concerned more with the attitude than the ugly allusion in the quip, Turnbo shrugs: “That boy ain’t got no sense,” he says. 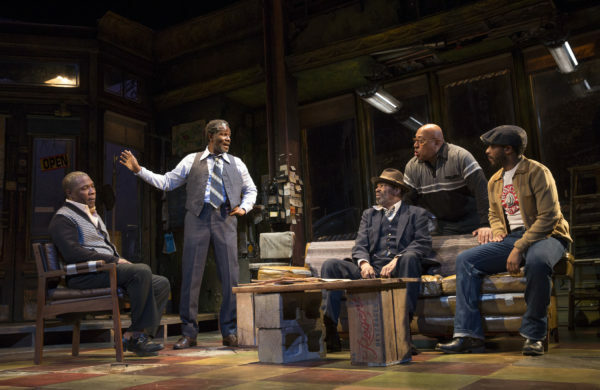 Jitney originally premiered in 1982 at Pittsburgh’s now-defunct Allegheny Repertory Theater, and thanks to a timely new production by Manhattan Theatre Club, it has just become the last of Wilson’s 10-play Pittsburgh Cycle to open on Broadway. Taking place in 1977, Jitney falls late in the Cycle’s century-spanning timeline. In this production and the play itself, the decades of struggle its characters have been shaped by – that is, the particular struggle of being black in this country – is highlighted with intensity. Systematic oppression, bred in slavery and nursed by Jim Crow, crackles here. First, there’s the setting. “Jitneys,” or illegal, unlicensed taxicabs, were commonplace in 1970’s Pittsburgh, primarily used out of necessity by residents of black neighborhoods that regular cabs wouldn’t travel to. The rusted-out, peeling interior of this jitney station (designed by David Gallo), feels as timeworn as the unmoving blue jalopy whose orange “For Sale” sign can be seen through dusty windows towards the back of the set. The older generation of drivers show themselves to be similarly worn. At the top of the hierarchy is Becker (John Douglas Thompson), who for twenty years has carried on his shoulders the weight of a dead wife and a son in prison. Working for him are Doub (Keith Randolph Smith), who proves to be Becker’s fellow voice of reason; Fielding (Anthony Chisholm), a tragic alcoholic who delivers at times humorous and at times profound thoughts through slurred speech; Turnbo, who, while the same generation as the older men, still holds within him a young man’s temper; and Youngblood. Naturally, Turnbo and Youngblood often bump heads, partly due to the former’s obsession with Rena (Carra Patterson), with whom Youngblood is in a relationship. This is the kind of ensemble that doesn’t need to be dissected: universally superb, it’s a cast full of clearly well-seasoned Wilson players, one through which the rhythmic nature of Wilson’s language pulses freely. And like improvised jazz, the play never gets overly structured, giving each major character a chance to take a solo. We learn about their lives and broken dreams: hopes dashed out by prison, alcohol, the military, or lost love and the poverty that stacked their decks from birth. We live as flies on their wall, catching glimpses of them existing together, learning piece by piece how each came to arrive there. Very late in the play, what feels like the beginning of a traditional plot emerges. Becker finds out that the jitney station is going to be shut down by the city (along with the other businesses on the block) in order to make room for housing projects. A sense of inevitability-powered forward momentum is created. Becker declares that he will fight the city in court and rallies the men, who decide that they will hire a lawyer and fight to keep their station. In another story, this battle would be the overarching plot, and the rallying together would mark the beginnings of the story. Think of an American Western where, midway through, we learn that, come sundown, bandits will arrive in the town, and the heroes must race to prepare for them. It’s the kind of plot driven by preparation for an inevitable event: the arrival of the bandits, or the arrival of the city evictors. But instead Wilson plants the seed of a traditional plot and immediately uproots it; because of the conditions Wilson’s characters have been born into, they don’t get to live out a traditional story. The story of these characters, and the generations of oppression that have disadvantaged them to the point that they work illegal jobs to keep a roof over their heads, feels especially potent in an America where some require an explanation for why the phrase “Black Lives Matter” is necessary in a way that “white lives matter” isn’t. The multi-generational scope of the play is heightened when it is viewed in the context of Wilson’s Pittsburgh Cycle at large – the oppression that broke lives in Fences, which takes place a quarter-century earlier, is the same oppression that echoes here, even if the two worlds are vastly different. This serves as a reminder that the current state of the nation that Wilson loved and also rightfully resented is not the result of a man or an election, but the sum product of generations. This production’s eclectic soundtrack (sound design by Darron L. West), which vacillates between funk, blues, and jazz, heightens this feeling of relevance – it does not have the period piece feel that another production easily could, which makes connections to the present all the more clear. And yet, despite the supremely difficult truths that the play illustrates, despite how clear the message, it is entirely built on an unwavering compassion for the beauty in its characters and a near-unfathomable respect for their humanity, as all of Wilson’s work is. In that way, it’s the perfect time for Wilson’s voice to return to Broadway – we still have much to learn from it.